Capacity building can do more harm than good. At times we use capacity building as a life support machine – keeping programmes or organisations artificially alive. Perhaps the more developmental way forward is to accept the inevitable end and allow them to die well. This can release unhappy and under-performing staff into new opportunities. Most of us have encountered good initiatives, good projects, even good organisations that have come to the end of their natural life. It is tempting to spend too much time, energy and money on nursing terminally sick organisations, while other initiatives, making more of a difference, go unsupported. Last year I was working on a large capacity building project with a number of UK organisations. For one of my clients in particular, responsible closure seemed the best option. Not only would this catalyse change in the partner, it would also free the captive staff into more productive and meaningful work. But I was still left with the dilemma of how to report this back to the funder as ‘success’. 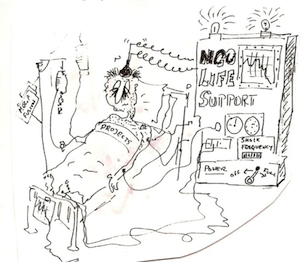 NGOs are notoriously reluctant to allow themselves to die. There are a few notable exceptions. The Diana, Princess of Wales Memorial Fund elected to spend out and close its doors at the end of 2012, having successfully completed its ambitious, time-limited programme of work. EveryChild UK is an impressive example of taking the radical step of putting into practice the once-popular NGO slogan of ‘working ourselves out of a job’. To increase the long-term impact on the lives of children, they will cease to exist as a separate entity and are transferring their income and assets to a new global alliance, Family for Every Child, managed and governed by national NGOs (from countries such as Indonesia, India, Mexico, and Ghana), which have co-created the new organisation with them. It does not take a genius to predict that the NGO sector is set for tough times ahead. The generous funding environment is changing. NGOs will face difficult decisions as stewards of increasingly limited resources. Radical times require radical remedies. For the good of our beneficiaries, those we ultimately exist to serve, we may need to become more ruthless and performance-oriented. 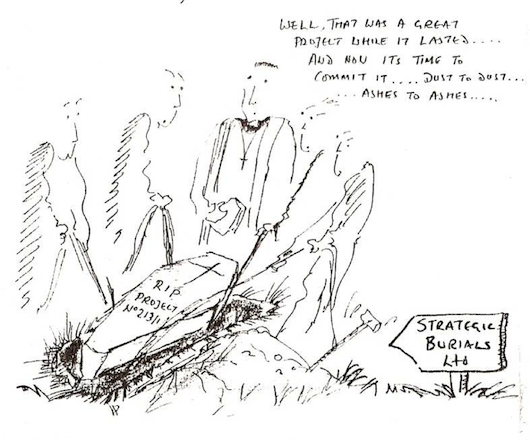 We may need to see strategic funerals as part of our ‘capacity building’ interventions. As Doug Reeler of the Community Development Resource Association (CDRA) writes in ‘A Good Death: In search of developmental endings’, we know from nature that death is an intimate part of any life cycle. As capacity builders, we may have to genuinely consider how we can help responsible closure, ensuring that as many as possible of the existing commitments are met, including seeing that others take responsibility for meeting the needs of beneficiaries. A good funeral appreciates all that has been achieved, gives thanks, and celebrates the life that has passed. It is an opportunity to reflect back and learn from the good and bad of what has happened. It provides an opportunity for people to express their grief and, in doing so, begin to clear the space to move on. A good strategic funeral for an organisation should help people to be freed from the burden of guilt, regret, and blame for any failures. It should be a gentle process of resolving, forgiving, and letting go – sacred processes. Strategic funerals should be a part of development, in the same way that death is a natural part of life. We may not like it. But it needs to be done well – responsibly. We can mark the endings and celebrate the achievements of the programmes. We can systematically learn from the good things and bad things. We can release talented and trained people into new initiatives. This does not mean it is any less painful or uncomfortable but it is a life process we need to do well. See article ‘Broken promises: Why handing over power to local NGOs is empty rhetoric’, by Anna Feuchtwang, Director, EveryChild.